We have an answer for you. More important, we have answers for women who need and deserve it most. It’s not a place for debate. Just real help, real hope, real solutions from women who have been there and expert voices. FFL members and donors already have a sneak peek in our latest magazine, “Beyond the Schism: Reclaiming Feminism,” but I need you to help get the word out now. • We have created a new handout for you to help explain what we aim to do. • We have new brochure for you to printout and distribute. • We have two stunning ads for you to post in your community and on campus. • And we have more than a dozen memes (and growing) for you to share on your social media. Envision seeing this fresh message in your grocery store, in a doctor’s office (especially pediatricians and OB-GYNs), etc. Ask your faith-based leader (if you have one) to post this near the door, and have some brochures handy for counseling. Best of all, this is free, but priceless to a woman in need. If you are on campus, share this with the health clinic, financial aid, athletic department, chaplain offices, and dorms. And don’t forget your local pregnancy resource centers, community health centers, pharmacies, human resource departments, places of worship, child care centers, family resource centers on base, rec centers (like the YWCA and community pools), businesses that cater to moms (women’s fitness, pregnancy yoga, etc. ), birth classes, and other organizations that might benefit, like breastfeeding groups. You can be a committee of one. You don’t need to form a chapter (but if you are in a group, take up the cause, too!). If you have ideas for other places to share it, or want to share your expertise or experiences to encourage other women, please contact us at info@womendeservebetter.com. Please let us know where you posted yours — and if you have other ideas! Thank you for making 2018 a year to remember as one where we truly served the unmet needs of those in need. P.S. 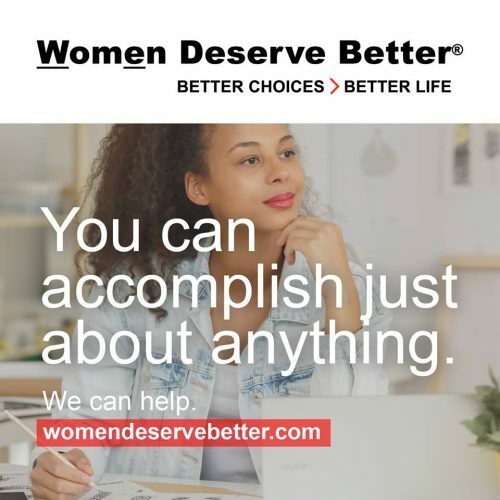 If you are an expert or have an experience or tips that might help others not already on WomenDeserveBetter.com, please email info@womendeservebetter.com for more information. We are also seeking other volunteers and interns to help on many other projects that can make a real difference in the life of women and children, please send a cover letter and résumé.